A new chapter in motorsports will be written this weekend as the first professional tour for electric cars take to a race course in Beijing China. After two years of active development by the FIA, Formula E comes to life as a zero-emission motorsport competition. For motorsport viewers needing a quick lesson into what is Formula E, the following details of the series will provide some quick insight into what to expect when seeing a 2014/2015 season race. For the inaugural Formula E season in 2014, the tour will run 10 races in some stunning locales. The series’ first race will take place in Beijing, China on what is called the Olympic Green Circuit (3.44-kilometer, 20-turn course). Race dates are also slated for London, Los Angeles as well as Monte Carlo. While nine dates are confirmed, the series starts with one race still left to be announced. Formula E will operate with a schedule that runs through the calendar year. The composition of a 2014/2015 Formula E season is something unusual in auto racing. When the Indy Racing League launched in 1996, the series attempted a similar scheduling strategy where May’s Indianapolis 500 would have crowned an overall season championship but it was quickly abandoned. 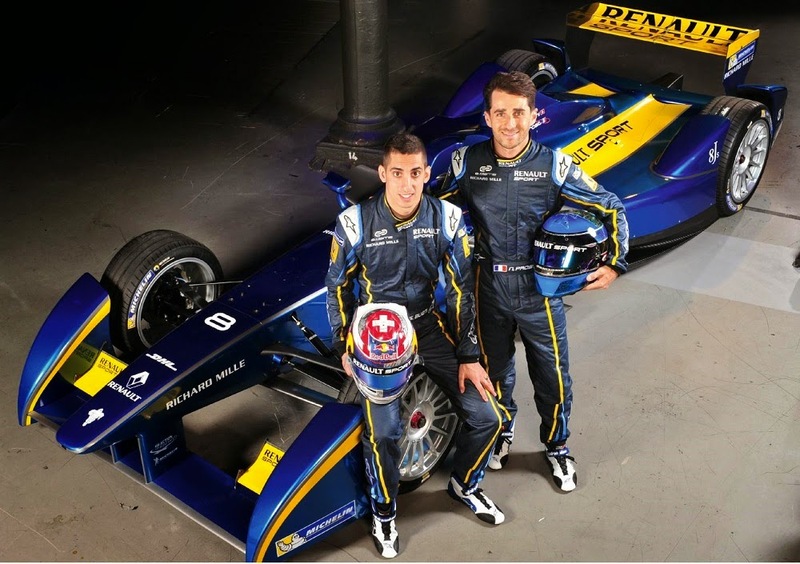 The Formula E will launch as a spec vehicle series with all teams competing with a Spark-Renault SRT_01E race car. Built by Spark Racing Technology, the car’s carbon fiber monocoque chassis construction has been outsourced to Dallara. The Formula E vehicle closely resembles a Formula 1 car but features some distinctive aerodynamic elements on the vehicle’s front wing and along the side. Minimum weight of a Formula E car is 888 kilograms with the drive included (just less than 200 kilograms heavier than a Formula 1 race car). The all-electric powertrain involves the cooperation between two organizations rooted as Formula 1 rivals. Subsidiaries of McLaren and Williams give the Spark-Renault SRT_01E Formula E car motion. McLaren Electronics Systems provides the electric motor and gearbox while Williams Advanced Engineering supplies the battery. Limited to a weight of 200 kilograms (440 pounds), the battery pack delivers 28kWh of usable energy. In comparison, the Tesla Model S features up to 85kWh of usable energy but weighs around three times more. 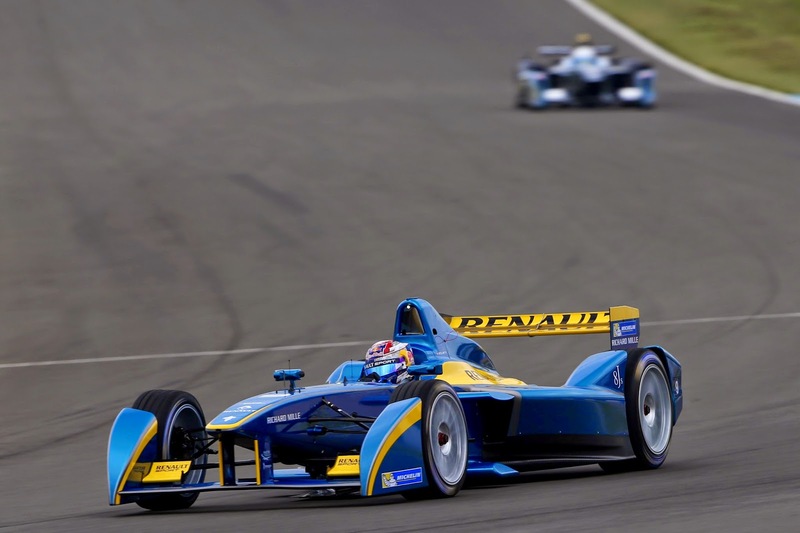 The electrical power system of the Formula E produces a maximum of 200 kilowatts (the equivalent of 270 horsepower). However, only 150 kilowatts will be available to drivers under a race mode. Because the electric motors are largely silent compared to Formula 1 cars, but the electric race cars do produce around 80 decibels of noise. Michelin will be supplying 18-inch treaded tires for the Spark-Renault SRT_01E designed to operate in dry and wet conditions. 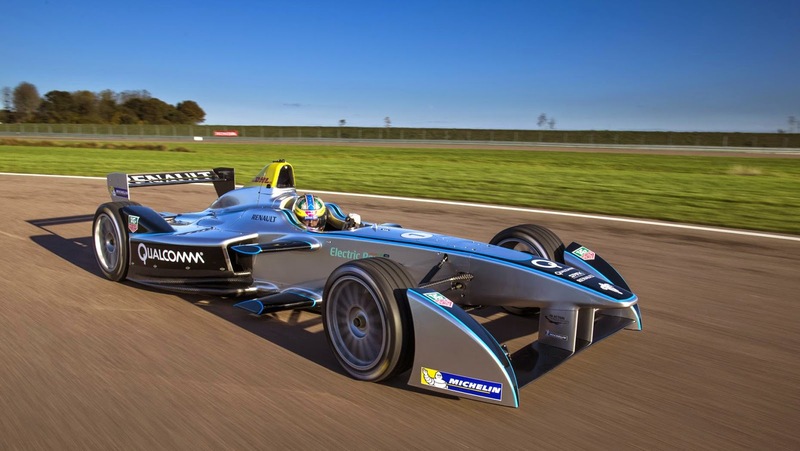 There will be 10 teams completing in the inaugural Formula E championship fielding two cars. Amlin Aguri, Andretti Formula E, Audi Sport ABT, China Racing, Dragon Racing, e.dams-Renault, Mahindra Racing, Trulli, Venturi and Virgin Racing are the names of the organizations participating in the 2014 season. Of the 20 drivers in the field for the first race, the 13 have driven at least one Formula 1 race. Some of those former F1 pilots driving in the 2014 Formula E championship include Bruno Senna, Jarno Trulli, Takuma Sato and Nelson Piquet Jr. Other notable drivers competing in Formula E includes Oriol Servia and Katherine Legge who will be one of two females part of the international championship along with Italy’s Michela Cerruti driving for Trulli. With practice and qualifying sessions, the 2014 Formula E weekend lead to the main feature race called the ePrix. The ePrix races will be scheduled to last around one hour. As the end of the ePrix, drivers are rewarded points for position, pole position as well as the race’s fastest lap. Using a similar system similar to that currently in use in Formula 1, the top-10 of every Formula E ePrix will even points for their position with the winner receiving 25 points. Unlike Formula 1, drivers will also be given three points for a pole position and two points will go the competitor setting fastest lap in each race. Having already mentioned the electric powerplant output of the Spark-Renault SRT_01E race car, Formula E will provide three lucky drivers with five seconds of additional power through a popularity contest. Called FanBoost, three drivers will be chosen by the fans through an online poll. The drivers with the most votes will receive five seasons where they receive 30 extra kilowatts of energy.